Current Status: The Prior Lake-Spring Lake Watershed District and the City of Prior Lake are in the development stage of this project. Feedback is being elicited from landowners surrounding the park, as designs are being refined. Please contact Maggie Karschnia, PLSLWD Water Resources Project Manager, to provide input on this project. Maggie can be contacted at 952-447-9808 or mkarschnia@plslwd.org. 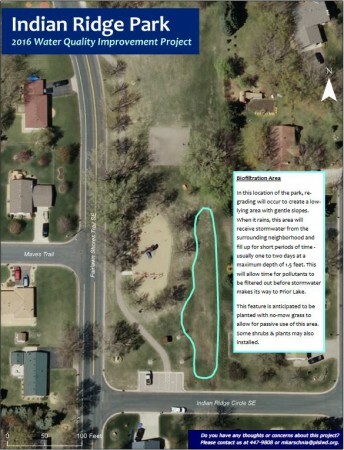 Partially funded by a grant from the Clean Water Fund through the Board of Soil & Water Reources, the Indian Ridge Park Project is part of the larger Lower Prior Lake Retrofits Project. The project will filter out sediments and nutrients from the stormwater that runs off properties and streets in the Indian Ridge Park neighborhood before it reaches Lower Prior Lake. A biofiltration feature will be installed by re-grading a grassy area of the park to create a low-lying area with gentle slopes. When it rains, this area will receive stormwater from the surrounding neighborhood and fill up for short periods of time – usually one to two days at a maximum depth of 1.5 feet. This will allow time for pollutants to be filtered out before stormwater makes its way to Prior Lake. It is anticipated that this feature will be planted with no-mow grass to allow for passive use of this area. Some shrubs and plants may also be installed. The project will filter out sediments and nutrients from the stormwater that runs off properties and streets in the Indian Ridge Park neighborhood before it reaches Lower Prior Lake. More exact quantities of nutrient reduction will be available once the project design is complete. Stay updated with this project through the PLSLWD News and Events Blog.